The video for Warning Nahi Dunga, the first song from Sunny Deol-starrer Blank, is a montage of shots featuring the action star walking angrily and purposefully towards all the terrorists out there who need to be taken care of. A look at Deol’s bulked-up self lumbering ahead to the music brings to mind how choreographers and filmmakers always designed the most hassle-free dance sequences for this star with two left feet. The 62-year-old actor’s dancing has strongly begun to resemble ambling these days as we have moved into the 2010s with the Yamla Pagla Deewana series. Deejay jokes aside, Bobby Deol does deserve credit for being the best dancer in the entire Deol family. Yamla Pagla Deewana (2011) title track. Do Indian action stars of a more testosterone-driven, pre-Tiger Shroff era dance badly because they cannot be bothered to charm their heroines with physical dexterity that demands romantic imagination? Or do they take to action because they cannot dance? No wonder that the Casanova sibling and the better dancer in Sunny Deol’s directorial debut, Dillagi (1999), is Bobby Deol. Evidently spoilt for choice, the heroine (Urmila Matondkar) goes for the sober option. Sunny Deol’s most iconic dance step in a four-and-a-half decade career is a blessing for Indian men who are bad dancers. Note how his dancing in Yaara O Yaara (Jeet, 1996) mostly involves his character standing at one spot, reacting to Karisma Kapoor’s bouncy frolicking. Easy-peasy. Yaara O Yaara, Jeet (1996). The template was set early on in Deol’s career. He barely moves his hips in the song sequences of his debut, the romantic drama Betaab (1983). The 1980s established Deol as an action star, for whom acrobatics were secondplace. All that was left to the deft-limbed Govinda and Mithun Chakraborty, and later, the metrosexual ilk of Shah Rukh Khan and his peers. Jab Hum Jawaan Honge, Betaab (1983). When Sunny Deol is the hero, there’s little Madhuri Dixit is allowed to do in the dancing department. Main Teri Mohabbat Mein, Tridev (1989). The sequence for Mera Dil Le Gayee from the 1997 film Ziddi offers a complete look at how Deol can pull off a non-heroine solo dance sequence without doing anything. Full marks to director Guddu Dhanoa for envisioning this moment. Mera Dil Le Gayee, Ziddi (1997). Sunny Deol’s hit director, Anil Sharma, however, ambitiously tried convincing us of the actor’s tap-dancing abilities. Wait for the two-minute-forty-second mark in the sequence for In Mast Nigahon Se (The Hero: Love Story of a Spy, 2003). In Mast Nigahon Se, The Hero: Love Story of a Spy (2003). All the hard work has to be done by the woman, Shilpa Shetty, in an unfair world where she is saddled with not just Sunny Deol but also fellow Bollywood beefcake Suniel Shetty. Here’s Shaam Bhi Khoob Hai from Karz: The Burden of Truth (2002). Shaam Bhi Khoob Hai, Karz: The Burden of Truth (2002). Imagine the brainstorming Deol’s choreographers had to contend with to get the actor to do something dance-like opposite his nimble heroines. 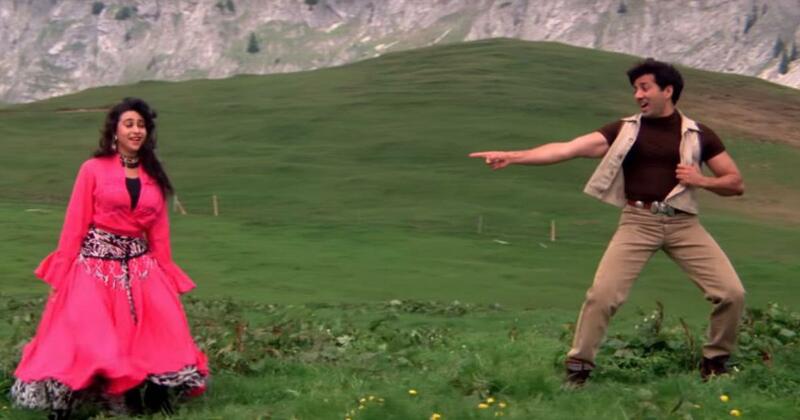 Here’s Deol from Darr (1993), tearing off lumps of grass and throwing them at Juhi Chawla. But the characters Deol has played throughout his career are not expected to be great dancers anyway. A licensed enforcer of the law or an Everyman forced into revenge, Deol’s physicality have been an integral part of his smash-first-think-later roles. To Deol’s credit, he is able to imbue his song-and-dance sequences with ample charm to sell his heroism to the audience. Dance can (probably) be learned, but charm? Never. Main Nikla Gaddi Leke, Gadar: Ek Prem Katha (2001).